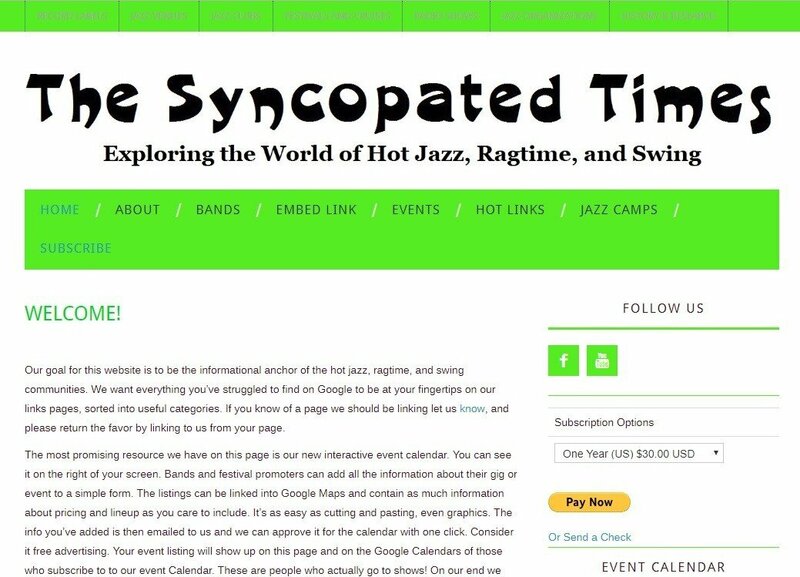 It was one year ago today that we invited the world to come see our new website, Syncopatedtimes.com. Three days earlier I started from scratch; I’d never set up a website before, I’ve never even had a blog! Just learning to say “hello” in the multiple languages involved was overwhelming. It still is. Ten years ago I would have never been able to figure it all out but many tools now make it easy(ier). At the time the website was envisioned as a directory to supplement the newspaper. A list of the bands and festivals we love. We also added an event calendar that people could add their events to. Neither idea lived up to expectations. The directory is still there. Listings on it do regularly get visitors from Google. I may extend its functionality at some point. Google is key. No one goes to a top page anymore. People will land on a directory listing but no one visits the directory itself and uses the search. Until I’ve found a way to list events in a way that will individually show up on Google I’ve taken down the calendar. The latest Festival Roundup is now all you will find on the events page. In July we quietly began posting all of our articles online and a few weeks later went to a paywall model. It supplements the paper and allows us to reach thousands of people who would never hear of us otherwise. And we have: 57 thousand different people have visited 73 thousand times and viewed 155 thousand pages. About 75% of that was in the last five months. Turns out that bringing people to a website takes constant work. A year ago, on day one, we had nine visitors and I could name most of them. It was a month before we broke fifty. It was fall before we averaged over 100 a day. Now we average 350 visitors and 700 pageviews a day. Our site numbers have been growing 20% a month since October. We are also slowly overcoming the hurdle of convincing people that our writing is worth paying for, and our writers are worth paying. The entire web site doesn’t produce the ad revenue of a single color sheet in the print paper, we depend on subscribers! The online ads are simply a service to the advertisers who support us in print, these are the people who provide the venues for our music to be played. Every few days we get a new online subscriber. Someone willing to put their money where their love is. Each one has me jumping in my chair. Eventually, it will hit a critical, comfortable mass. Thank you for giving me the encouragement to get through our first year online! Previous Big Announcement! Please Share!